I really like Latex… Pillows! They’re really comfortable and super long lasting so you get a lot of value for money and the Hypnos High Profile Latex pillow is no exception. There is a low profile pillow and a high profile so let’s start with what’s the difference. Basically it’s just about how you sleep, the low profile is shorter so your head lies closer to the bed, only really good if you’re a front sleeper or maybe a side sleeper. Meanwhile, the high profile is taller so much better for back sleepers and side sleepers. If you’re a little bit of everything then the high profile is the way to go. It’s quite a firm feel and there’s definitely a weird smell when you first open it but that’s completely normal for a latex pillow, it’ll go away in a few days. Latex is a totally natural material which is nice, it’s made from the sap of a rubber tree and then treated without chemicals to turn into the bouncy material that’s in your pillows. But what has to be my favourite thing about the Hypnos latex pillow is that it’ll last for years, while regular pillows go flat over time latex just doesn’t! It stays firm and plump for many many years so you get great value for money. You’ll easily get 5 years out of it but I could see it lasting up to 10. The superior Hypnos High Profile Latex Pillow shows off irresistibly soft Talalay latex. The high profile pillow has been created to a high standard to provide the greatest comfort aimed at side and back sleepers, the High Profile has a higher density providing superior support and pressure relief. Latex is breathable, keeping you cool and dry, providing a soothing and relaxing sleep surface. A plush velour removable cover graces the surface of the pillow, leaving the latex room to breathe with its small air pockets. 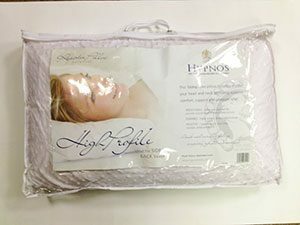 The Hypnos high profile pillow is made from Talalay latex, this is breathable which helps maintain a cool and comfortable sleeping surface.